Hi, Meet Shiloh! 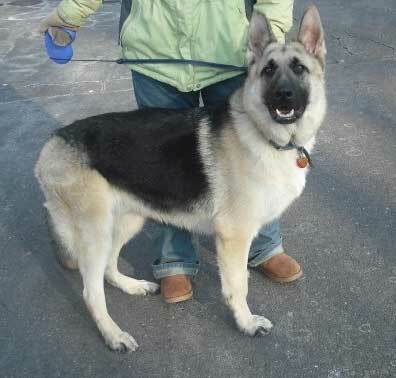 He is a 2 year old GSD. He warmed our hearts and excited us as soon as we downloaded his baby pictures and his GIANT paws slowly loaded onto the screen 1st. I asked myself"what did I get myself into?". The rest of the photo appeared and there stood a teddy bear of a puppy who would change my life. He is just what he looked like, a teddy bear of a momma's dog wrapped up in a huge body of a strong,brave,sturdy,adventurous German Shepherd. He loves to hike with the family. We have two teens who he thinks are sheep. He will protect them at all costs on hikes,especially our autistic 17 year old. Last week,Sam...my 17 yr old. scaled a 20 foot rock wall,Shiloh was so worried he paced for about 5 seconds at the base. Then before we knew it he too started scaling this steep wall! There weren't any holes for his paws to go but he made it up and stood faithfully with Sam as a protector.I have no idea how on earth he did this! No matter where Sam went Shiloh went. To the edge of a steep waterfall.....Shiloh stepped one foot more out on the ledge between sam and the falls so Sam wouldnt stumble in. This dog is amazing. On the walk back I got tears in my eyes as I watched him walk in back of us then in front then to the side herding his family safely back to the car. Once back at home Shiloh is very vocal.....'speaking' for everything he wants,dropping his food bowl on your lap....and rolling over for tummy rubs.It is now that he becomes that momma's puppy and I give in and baby him.He deserves it. 110lbs of dog wanting to tug a blankie back and forth.He deserves it,he would give his life for us at any moment.He is a blessing. Thank you for letting me share Shiloh with you! Wow, what an amazing boy! My sister works with autistic children and would love to hear this story. Dogs are so intelligent, especially German Shepherds. It's amazing how they look out for their people and they know when somebody has special needs. What a special dog indeed! Shiloh sounds wonderful you are blessed! Awwwww, how sweet... And Shiloh is absolutely gorgeous!! !